Gospel singer Christonimph Wambui Mburu, known by her stage name as Vivah Musiq, is dead. 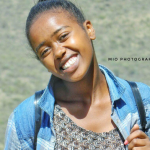 Vivah died in an accident at Kikopey along Nakuru-Nairobi highway on March 22 after a trailer lost control and rammed into a fleet of several vehicles including a matatu, killing all the 12 passengers. Promising The singer, who is popularly known for her song Jipe Moyo, was among the 22 killed in the crash that has left the country in a somber mood. Following Vivah’s death, countless people including fellow musicians and fans thronged social media to condole with her family. Several celebs have posted their condolences message online. Vivah was a young promising artist and its so sad that she had to die so young. May she rest in peace. The post Gospel singer Vivah Musiq among those who died in grizzly accident at Kikopey appeared first on Ghafla! Kenya.